Event tech guru, Sami, explains how VR is beneficial to the events industry. Big brands are already using VR meaning it will be made accessible to a wide audience very quickly. With backing and integration from companies such as Facebook, Samsung and Google, it won’t be long before high-end handsets are within consumer reach at affordable prices. Our panel of experts expressed that investing in VR should raise the same thought process and budget considerations as other mediums. How much value does it bring to your event as a medium and how would your audience use it? VR can be a sales tool from selling more premium plane tickets at Thomas Cook to dramatically increasing charity sign ups, VR is the current height of experiential technology and these big brands are already reaping the benefits. Virtual Reality can be used on the go or in an exhibition setting, making it the best way to show off your event to future potential clients, delegates and shareholders. It is a phrase that is no longer only heard in futuristic sci-fi movies; it is slowly engulfing us all into its hyper-real universe, one megapixel at a time. Here at London's most central venue, we have adopted this extraordinary piece of technology to create a tool in our sales strategy. 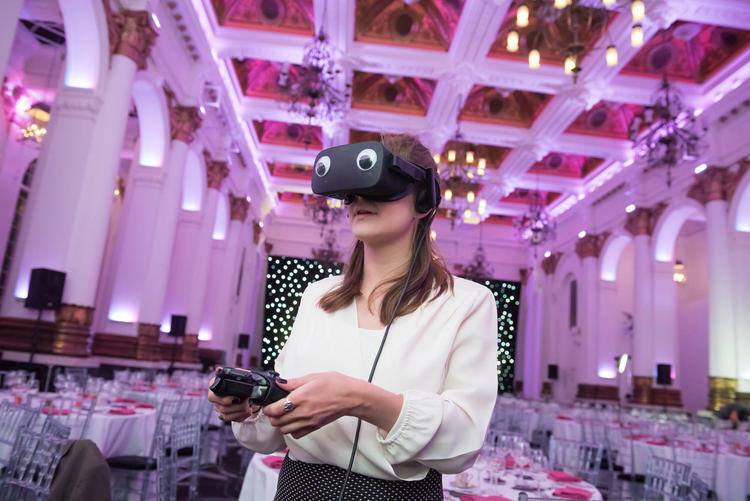 We wanted to showcase how virtual reality isn’t just about being absorbed into the best computer games, but how as London's most central venue, it’s a business tool that keeps on giving. On Monday 6th June 2016, we did exactly that. Guest’s arrived in the Old Billiard Room and Annex to be greeted with canapés and drinks by AlchemyLive.There was a sea of Samsung Gear headsets, demonstrating our virtual reality videos, giving a clearer understanding of how they can be used in the events industry and right here at London's most central venue. The HTC Vive was a star attraction, guests were experiencing everything from playing fetch with a dog to swimming with sharks. Sarah Kay, Founder of Story Events commented on her fear of sharks and how it may help her overcome it, could virtual reality be the cure to phobia's? Guests could also try out the much-talked-about Oculus Rift and the one that started it all; the Google Cardboard. We wanted to not only show the evolution of the headsets, but also how each is a different experience in itself. The HTC Vive is impressive and fantastic for being transported into a gaming dimension but the large machines and wires make it immobile. The Samsung Gear headset is compact and wireless, making it an ideal way to show off your event. Charles Boyd, Director of 8 Northumberland Avenue, London's most central venue, opened the discussion with a short welcoming speech and introduced our Keynote speaker from Hotwire PR, John Brown. Using Glisser, an interactive link that your audience can engage with via, we kicked off with some polls to find out how much people already knew about VR. “Our earliest forms of communications (grunts and cave paintings) wanted to get across our experience of the world. This has not changed. We don’t think Darwin saw this one coming. John went on to explain how at select universities, students can now be a part of open-heart surgery via virtual reality headsets. Moving, cutting and prodding, just as they would manoeuvre through actual surgery without the pressure of having a real life in their hands. He explained how soldiers are now being trained on things such as bomb disposal and how the Oculus Rift caused offence by creating the experience of being a victim of 9/11 by putting you inside the World Trade Centre. "Technology is not the reason why you do something, technology just enables you to do something more effectively." "For me this is an opportunity to do things we couldn't do before"
"It's the experience that is the most important thing"
Kudzi also explained how Thomas Cook put virtual reality into use by showing a customer what his upgrade would be like and the experience of visualizing the extra legroom led him to purchase. In a life where everything can be purchased on the internet, people rely on travel agents for validation and VR does exactly that. To book a show round or enquire about an event at London's most central venue, contact us here.